This text has been designed as a supplement to the Textbook of Surgery to assist readers in their preparation for examinations and to test their knowledge of the principles and practice of surgery. There are two types of Multiple Choice Questions: Type A and Type X. Type A have a single best response from five alternatives and are designed to test judgmental ability. Type X questions contain a stem with suggested answers that are either true or false and are designed to test factual knowledge and its application. The text is set out in three sections, the first containing Type A questions, the second containing Type X questions and the third containing short answer questions that emphasize clinical management problems. 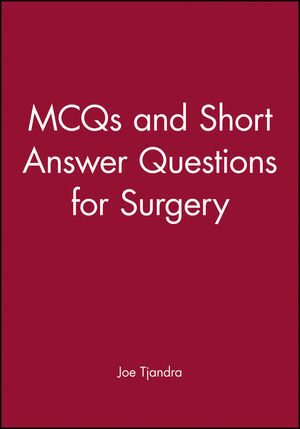 In each section, the questions are presented in the sequence used in Textbook of Surgery. The number of questions for each general topic relate to the relative importance ascribed to each topic in order to provide balance. The answers are accompanied by a reference to the chapter(s) in the Textbook of Surgery where the information required to answer the specific question is presented. Joe Tjandra was extraordinary and amazingly talented in the field of colorectal surgery. He was born in Palembang, Indonesia in 1957 where his father was a trader. He was the youngest of seven children of whom four became doctors.